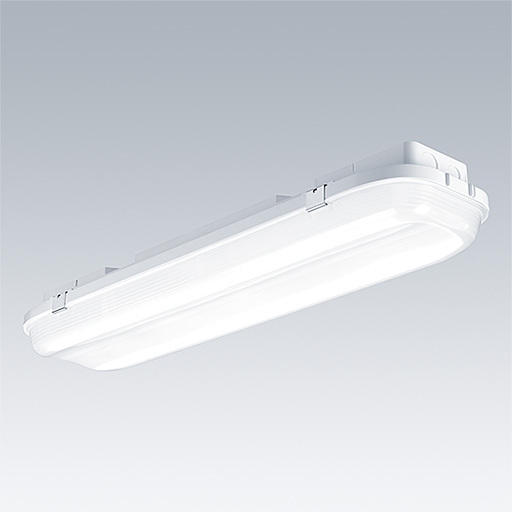 A compact IP67, dust and moisture proof LED luminaire. electronic - fixed output fixed output control gear. Class I electrical, IK10. Canopy: fully recyclable aluminium painted white. Diffuser: polycarbonate with linear prisms. Toggles: stainless steel. For surface, BESA or suspended mounting and outdoor wall mounting without canopy. Quick-fix brackets supplied for surface mounting. Mounting kits for conduit, chain suspension and catenary suspension are available as accessories. Equipped with through wiring and quick fit connection at both ends. Complete with 4000K LED.